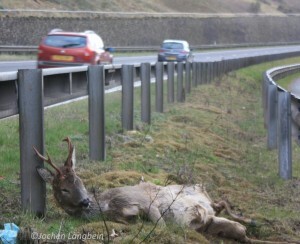 MAY is the PEAK MONTH for deer road casualties and related vehicle collisions across Great Britain as a whole. Over 10,000 deer are likely to be hit in May alone – that’s close to twice as many as in any other single month and makes up near 15% of the annual toll of between 60,000 to 74,000 GB deer road casualties. 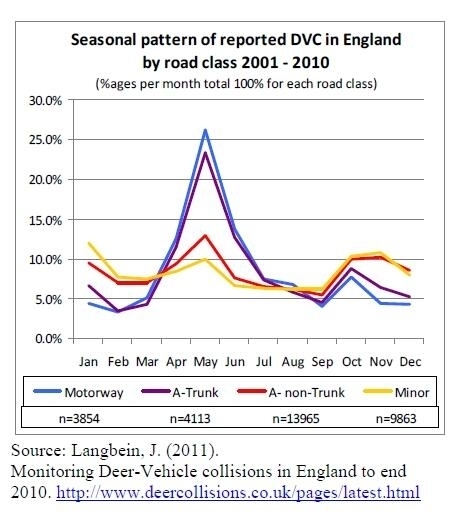 This peak in Deer Vehicle Collisions (DVCs) is, as shown in the graph below, far less pronounced on minor roads that deer may cross on a daily basis when moving from cover to feeding areas, and which of course in general carry relatively modest traffic volumes. For motorways and major A-class trunk roads however, the spring peak in DVCs from April through to June makes up over 50% of the annual toll. At this time young deer coming up to one year old (especially the territorial roe deer, which are our most common and widespread UK deer species) will tend to be pushed out of their natal ranges, and as they disperse in search for new home ranges will be much more likely to attempt to cross the more substantial barriers presented by dual carriageways and motorways. 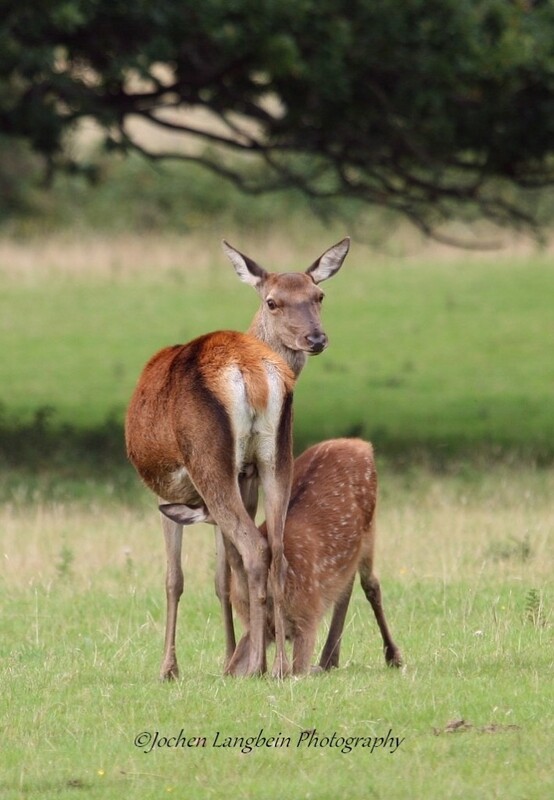 Aside from dispersing animals, adult females too will increasingly cross roads during May on their way to – or often with new fawns at heel – as they return from more secluded areas of cover that they may seek out for giving birth. Oddly enough, even though road side verges may seem rather noisy places to us, as vegetation grows denser during spring they become increasingly attractive for deer and other animals to settle within, because scrub and linear strips of woodland alongside major roads and even on roundabouts and between slip roads will often be relatively undisturbed by pedestrians and not least dog walkers. 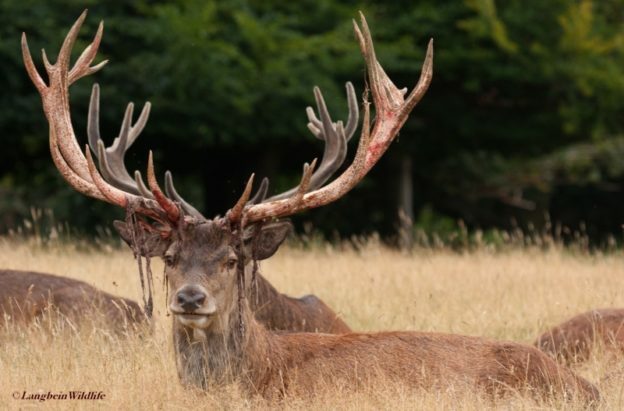 A further, but overall smaller peak in DVCs occurs in autumn, when our three largest deer species (red, fallow and sika) will be on the move again to and from their rutting areas. This second peak in deer accidents from mid-October through into early November tends to be most prominent in: A) Large community forests where fallow deer predominate – including Cannock Chase, Ashdown Forest, The Forest of Dean, Epping Forest, Haldon Hill, Ashridge Forest, The New Forest and also The Royal Parks of Richmond and Bushy; and B) throughout those regions of the country with high concentrations of wild red deer such as The Scottish Highlands, Grizedale Forest, and Exmoor and The Quantock Hills. In addition to late autumn being the rutting season for the large deer species, when adult males will often chase blindly across roads in pursuits of females or rival males, the shorter day lengths bring rush hour traffic periods in line with the peak dawn and dusk activity times of all our deer species deer, adding further to an increase in deer collision risk. Click here for more tips on avoiding deer collisions or what to do if you are unfortunate enough to be involved in one. And to help map DVC hotspots please do log the dates and locations of any deer road casualties you may on this on-line reporting form. Next post : Watching two wild Exmoor Stags through the seasons. This entry was posted in Deer, Wildlife and tagged Cerf, Damwild, Deer, deer crash, Roadkill, Spring on May 19, 2016 by jochblog.